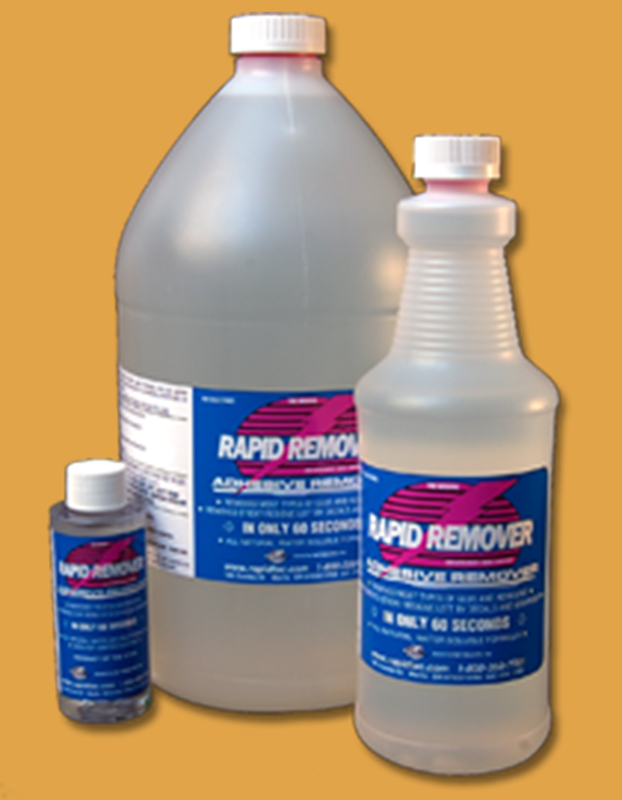 Rapid Remover Adhesive Remover For removing adhesives quickly without damage or mess Keeping it simple. When your faced with removing adhesive we have your solution. Rapid Remover is a non-toxic, water-soluble adhesive remover that breaks down and removes adhesives in as little as sixty seconds! Spray it on, wait a few minutes and easily wipe away residue adhesive with a plastic squeegee and paper towell. Not only is does Rapid Remover work fast, but it works without causing damage to most painted or bare metal surfaces. What may have been a four-hour job (and a messy one at that) can now be cut in half with an easy, clean and non-damaging removal. Gone are the days of using dangerous and risky chemicals that often damaged painted surfaces, and had numerous health hazards. Rapid Remover works. It’s that simple. *Ships UPS/FedEx GROUND only, local delivery and will-call.